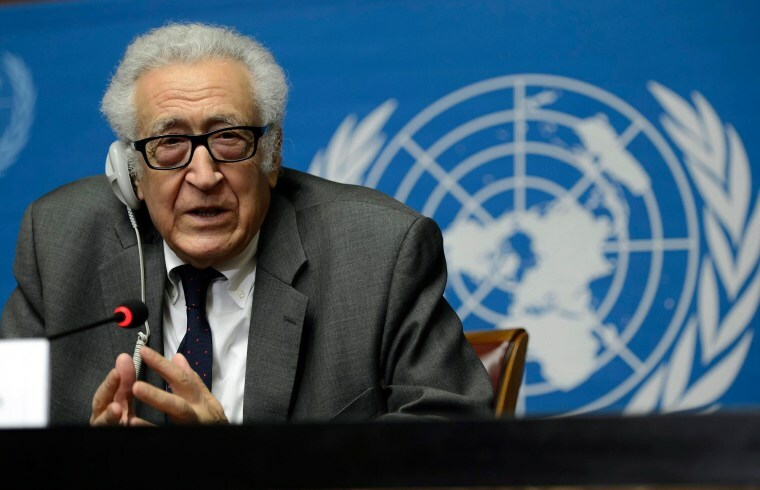 UNITED NATIONS - Syria mediator Lakhdar Brahimi will step down on May 31, U.N. Secretary-General Ban Ki-moon said on Tuesday, blaming an international deadlock over how to end the country's three-year civil war for hampering a bid to broker peace. International and regional powers have backed opposing sides in the civil war that has so far killed at least 150,000 people, with Russia and Iran supporting President Bashar al-Assad and Western powers and Gulf Arab states largely backing the rebels. Brahimi had long threatened to quit, just as his predecessor - former U.N. Secretary-General Kofi Annan - did in 2012. Annan resigned after six months as the U.N. and Arab League joint special representative on Syria, slamming the U.N. Security Council for failing to unite behind efforts to end the fighting. Brahimi, a veteran Algerian diplomat, briefed the 15-member Security Council for the final time on Tuesday. "I go with a heavy heart because so little was achieved," he told the closed-door session of the council, according to the his statement which was obtained by Reuters. "I once again, humbly apologize to the Syrian people." He left "a few ideas" with Ban and the Security Council - focus on getting more aid into Syria, reduce and end the violence, end the flow of arms into Syria and help form an executive to lead Syria's transition by organizing a national dialogue, conference, constitutional review and elections. Ban said he would work on finding someone to replace Brahimi. There are several possible candidates, diplomatic sources have said, among them former Tunisian Foreign Minister Kamel Morjane. "At this time, I have to think who should be the right person and at what time," Ban said. Ban praised Brahimi's perseverance in the face of "impossible odds, a Syrian nation, Middle Eastern region and wider international community that have been hopelessly divided in their approaches to ending the conflict." "That his efforts have not received effective support from the United Nations body that is charged with upholding peace and security, and from countries with influence on the Syrian situation, is a failure of all of us," Ban told reporters. The 15-member U.N. Security Council has been split on how to deal with the war in Syria. Syrian ally Russia, supported by China, has blocked three resolutions that would have condemned President Bashar al-Assad's government, threatened sanctions and called for war crimes accountability. In announcing Brahimi's departure, Ban said: "There must be accountability for the terrible crimes that have been - and are being - committed. Such crimes include the deliberate starvation of communities by preventing humanitarian access." Syrian U.N. Ambassador Bashar Ja'afari said the Syrian government noted Brahimi's resignation, adding that he should not be blamed for "all of the mistakes." "The American administration made mistakes, the French government, the British, the European Union, Qatar, Saudi Arabia, Turkey - all of them made mistakes," he said. "The main mistake was the interference by these foreign powers into the domestic affairs of the Syrian people."